Smoked sausage – a product with a long history. Smoked sausage was served on a dinner table in Ancient Rome, a smoked sausage in medieval Europe, in Russia, this product Peter the great brought Germans. No wonder one of the nicknames given to this nation by the Russian people – "sausage makers". Almost every nation has its own, special recipes smoked sausage – this is Vienna sausage, and Spanish chorizo and Italian mortadella and hundreds of other varieties. Delicious product is stored for a long time, but it has its own "requirements". container for storage of food products. Storing cabasicanimation smoked sausage in the sealed shell is not required to store in the fridge. Hang the stick in a well ventilated area with temperatures from 10 to 16 degrees Celsius, and it will be preserved for at least three months. If you keep it longer so, it is not so much spoiled as you wither, rather zakamenne and treats turn into a weapon. To "revive" this sausage is possible – you just need to wrap it in a damp linen cloth and put into the refrigerator. Of course, this sausage will lose a little in flavor, but at least you will be able to cut and chew. Another method, which is suitable for too hard sausage – steaming. Boil water in a large saucepan, place it over a steamer or just a colander, put the sausage, reduce the heat to medium and keep the sausage over the steam for 20-25 minutes. Still warm sausage store in the refrigerator. In the refrigerator a stick summer sausage can be stored for about a year. Keep it in the vegetable or fruit compartment. If the shell of the sausage will appear whitish patina, wipe the stick with a cloth soaked in vegetable oil. Sausage, which you have already begun to slice, store in the refrigerator, wrapping the cut with cling film or removing the stick into the container. Storing smoked sausage, cut into kusochkami can store the sausage in vacuum packaging without opening it, in accordance with the designated deadlines. Sliced sausage store in plastic container or wrap in waxed paper. Also suitable for food film. 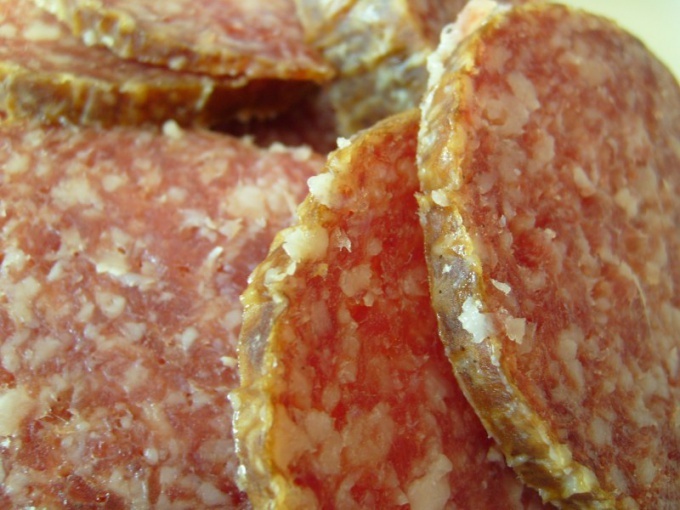 Salami slices can be stored for 5-7 days, always in the fridge. You can freeze the sliced sausage. To do this, wrap the slices in foil or store in zip-package. Carefully squeeze out of the package air and put the sausage in the freezer. So her shelf life will last up to 3-6 months. Before serving frozen sausage to the table, let it thaw in the fridge for 3-4 hours.